Up-scale 1080p to UHD 4K (3840x2160) 4:4:4 60Hz for connection to 4K displays. Down-scale 4K (4096x2160 or 3840x2160) to 1080p to view 4K sources on an HD screen. Up-scale 1080p to UHD 4K (3840x2160) up to 4:4:4 @60Hz – change an HD device like a Blu-ray player or cable box into a 4K video source. Down-scale 4K (4096x2160 or 3840x2160) to 1080p – view video from a 4K source on an HD screen. Does not support frame conversion - input and output must support the same frame rate. Bandwidth up to 18 Gbps. Built-in HDCP 2.2 to HDCP 1.4 converter - play video from an HDCP 2.2 source on an HDCP 1.4 4K display. 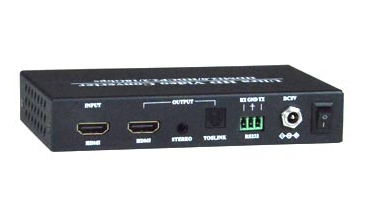 Extracts audio from HDMI input and outputs with 3.5mm stereo audio jack or Toslink. Supports HDMI cables up to 50 feet. Bypass non 1080p and 4K resolutions. Front panel EDID configuration button. Ideal for use with switches, splitters, matrixes, and any other application needing to accommodate both HD and 4K sources and displays. One 3.5mm stereo audio output jack. One digital optical S/PDIF TOSLINK audio output jack. Does not support frame conversion – input and output must support the same frame rate. WxDxH (in): 5.63x3.26x1.02 (143x83x26 mm). Max HDMI cable length: 50 feet.